Although game-used baseball cards have been around since 1997, it took a couple of years for them to go from novel rarities to expected hits. At 32 cards, 2000 Pacific Invincible Baseball offered one of the most extensive game-used checklists at the time. And while most of the cards have been largely forgotten amid a massive sea of memorabilia cards, one has become a part of hobby folklore. 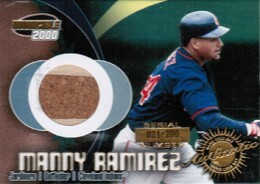 Not long after the set was released, a Manny Ramirez corked bat card surfaced. For years, the card has become something of an urban legend in the hobby. Was Manny Ramirez a cheater? Was it a Pacific publicity ploy? Was the cork real? Could it have been mixed up with a teammate. Given the high stakes involved at the time, the on-the-record story was filled with denials and "no comments." On the Friday, January 27th episode of Cardboard Connection Radio, the truth behind the Pacific Manny Ramirez corked bat card finally came out. The show's first guest was Jeff Morris, the former Vice President of Marketing with Pacific Trading Cards. He started with the company amid the fallout of the Ramirez card. While he wasn't directly involved with the incident, he did have intimate knowledge of the situation. About 27 minutes into the episode, Morris shed some light on the story behind the card. And, according to him, it wasn't a desperate ploy by the trading card manufacturer. "We had a photographer that would go around and get game-used bats and he acquired two bats from the Indians," said Morris. "The great thing about the fact that our photographer was doing it was because we could ID the markings on the bats by his photos. So we know the bats that we got were game-used." Morris continued, "[W]e got a call from saying, 'You're not going to believe this. There's cork in the bat that we cut up and some of it got onto a card.' We were very adamant... make sure that does not get onto a card. It was just like a nightmare. And sure enough, there were a couple of them that got out." When the card emerged, there was lots of finger-pointing. Still basking in the glow of the Mark McGwire and Sammy Sosa home run chase and without the steroid scandal being public knowledge, baseball didn't want any black eyes. Morris addressed the pressures the card caused. "Of course, there's all kinds of rumors. Everybody speculates, 'Oh, yeah, Mike Cramer did this, that and whatever just to get his name in the paper.' We heard all kinds of thing, but you know what? We were hitting the panic button, thinking we got to make sure this doesn't happen." So while it brought Pacific plenty of media attention, it was attention they didn't necessarily want. They certainly didn't seek it out. One of the Pacific Manny Ramirez corked bat cards is currently listed on eBay. The asking price? $5,000. But what about the second bat that the photographer acquired? According to Morris, Pacific CEO, Mike Cramer kept it. As the company approached its final days, Cramer's curiosity got the best of him. "He'd gone down to the airport and put it through the x-ray machine," said Morris, "and sure enough, it was corked too." Manny Ramirez a cheater? Who would have known?